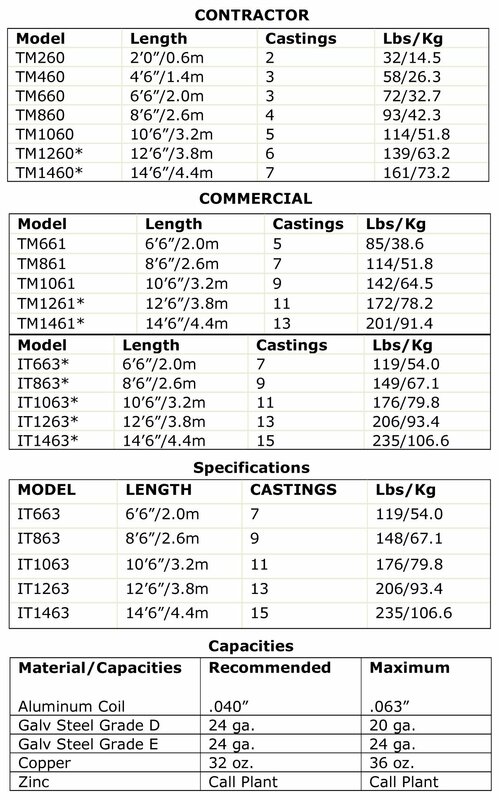 Mark IV TrimMaster Brake Series Specs. The Mark IV Industrial TrimMaster®, featuring new POWERslot™ technology, provides single user setup and operation in the shop and on the job site. Non-marring vinyl strips protect clad finishes leaving clean crisp bend lines and hems. Our unique cam-locking system clamps to the thickness of the material and not to a factory preset. Should you ever need to fine-tune your brake, each casting comes with independently adjustable UHMW plastic wedges. While some brake manufacturers have taken away your ability to make these adjustments, its nice to know TrimMaster gives you the choice, even if you never have to use it. We won’t use smoke and mirrors to try and convince you that you need a non-adjustable brake. Some of our brakes have been out in the field 30 years without needing adjustment. But should the occasion arise, its nice to know you can adjust your Van Mark brake to best fit your work conditions, not ours. 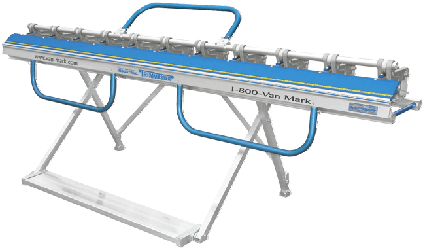 New Powerslot technology, developed by Van Mark, allows variable levering of the bending hinge along an accurate (curved), slot in the fixed hinge. The results are a truly unique bending experience that allows optimal bending power to be maintained along the point of contact with the material. Think of it as sliding fulcrum, which shifts during the arc of your bend thereby extending your leverage while decreasing the power needed to make the bend itself. In short, TrimMaster gives you more bend with less energy. POWERslot technology gives you more bending power with less energy resulting in a truly unique bending experience. Added walls and hollows make TrimMaster brakes the toughest machines out there while providing the same long service life you’ve come to expect from a Van Mark Product. 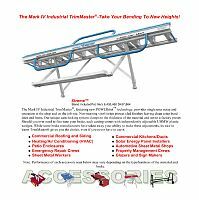 The New Mark IV Industrial TrimMaster, also featuring new POWERslot technology, provides single user setup and operation in the shop and on the job site. Non-marring vinyl strips protect clad finishes leaving clean crisp bend lines and hems. Our unique cam-locking system clamps to the thickness of the material and not to a factory preset. Should you ever need to fine-tune your brake, each casting comes with indecent-dently adjustable UHMW wedges. While some brake manufactures have taken away your ability to make these adjustments, its nice to know TrimMaster gives you the choice, even if you never have to use it. - Strongest capacities and longest service life. 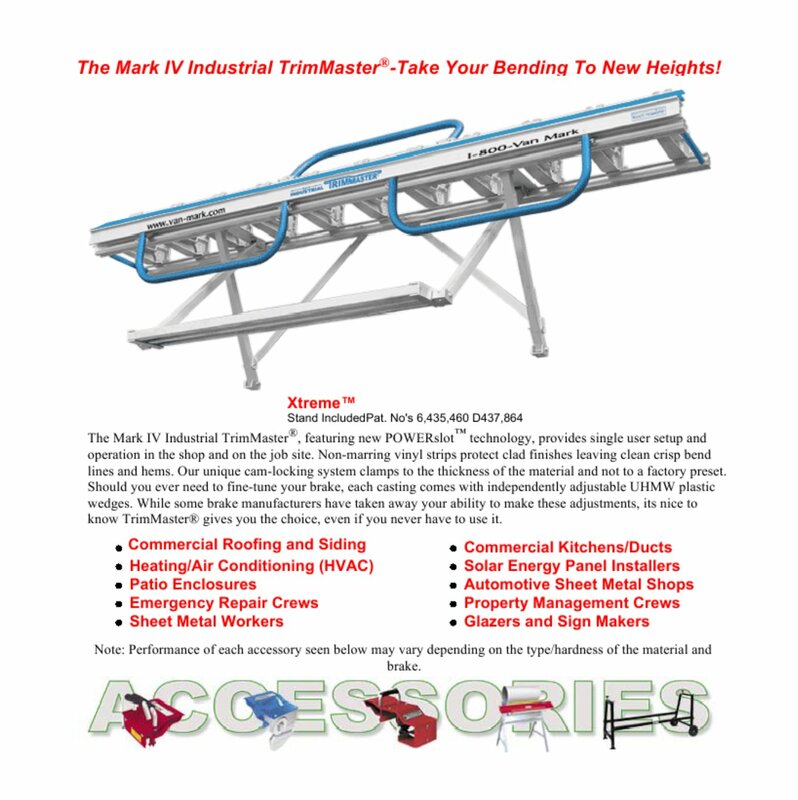 The Mark IV Industrial TrimMaster-Take Your Bending To New Heights! 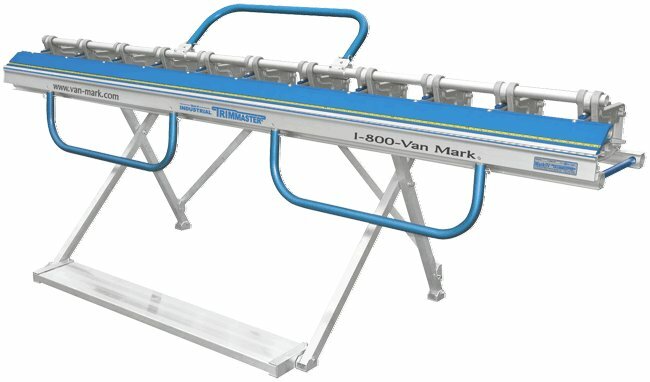 The Mark IV Industrial TrimMaster, featuring new POWERslot technology, provides single user setup and operation in the shop and on the job site. Non-marring vinyl strips protect clad finishes leaving clean crisp bend lines and hems. Our unique cam-locking system clamps to the thickness of the material and not to a factory preset. 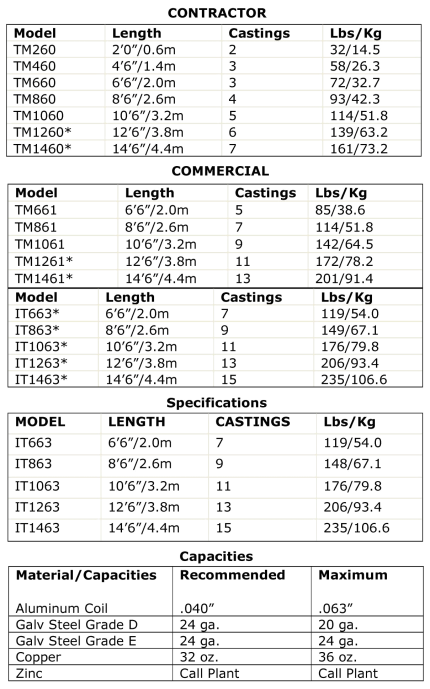 Note: Performance of each accessory seen below may vary depending on the type/hardness of the material and brake. 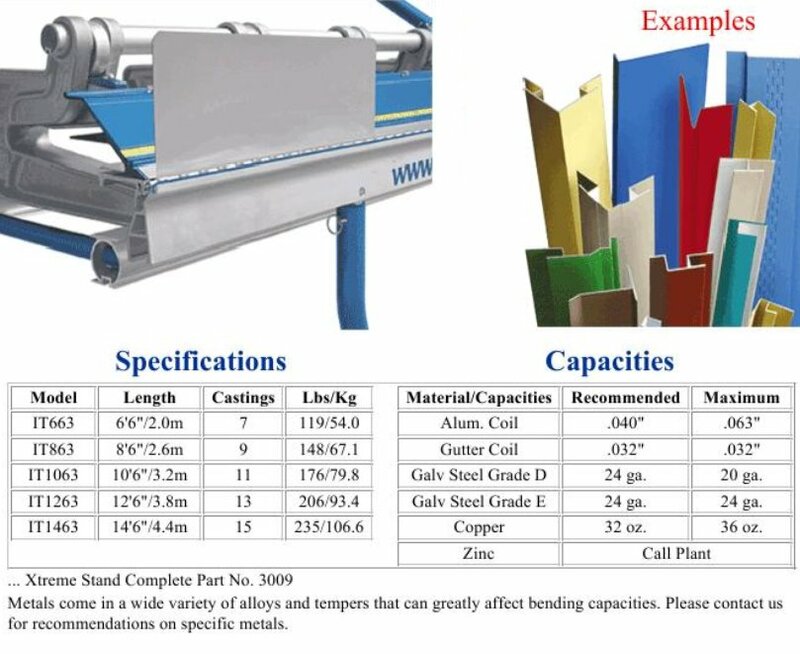 Metals come in a wide variety of alloys and tempers that can greatly affect bending capacities. Please contact us for recommendations on specific metals.